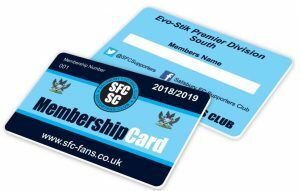 Join the Supporters Club today for the 2018/19 season! Together, we can really make a difference! The membership fee remains for the third year running at just £5 per adult, £3 for U16s or £12 for a family of 4. The money will be used to run the Supporter’s Club and to support the football club! Every penny will be spent either on you, the supporter or on specific projects that the football club asks us to help them with. Discounted entry to Supporter Club Events. But most importantly, we aim to be your voice. We will be in constant contact with the Football Club and present your ideas, suggestions and criticisms to the directors. So, don’t wait any longer, press that button and join now! The fee can be paid by Credit or Debit via Paypal (please use the Friends and Family option) during the registration process below. Alternatively, you can sign up in person at the Supporters Club stand during home matches and pay in cash.